This entry was posted in Racing on July 4, 2013 by Steve Tilford. I haven’t been to Madison since January at Cyclocross Nationals. That is where the year went haywire and I destroyed my shoulder. So far, it’s been alright. But, since I didn’t get up here until 11 pm last night, there isn’t much that could go wrong. The drive was an easy 550 miles. I like the drive up from Cedar Rapids Iowa to Madison on highway 151. It is super scenic. It’s a 4 lane divided highway, through rolling hills and beautiful farmland. It crosses the Mississippi River in Dubuque Iowa. Last night, the river was full of 100’s of boats waiting for the firework display that they were obviously going to do over the river very soon. 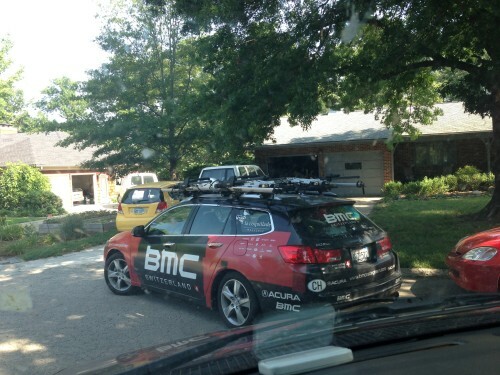 Trudi drove the BMC team car here a couple days ago and worked the U23 road race yesterday. Her guy, TJ Eisenhart, got 8th in the road race. I guess it blew apart early and got back together and then blew apart again. He has to race the time trial at 9 this morning. I’m not sure why anyone would schedule the U23 Nationals in such a screwy way, putting the road race and time trial back to back, early in the morning. It isn’t a stage race. These 18 to 23 year old guys need their sleep and don’t necessarily function that well at early morning hours. I’d bet guys sat out the road race to do well in the time trial or vise-versa. I don’t think, if you travel all the way to the National Championships, you should have to choose between one or the other. It just doesn’t make any sense. They might as well do the criterium tomorrow afternoon. I’m going to watch the Tour and then go over to the road course and ride a lap. I’ve raced the course before, but it was a few years ago. I don’t really see any reason to be tired before the race, so I’m only going to ride a little today. I’m having a hard time getting going early in races, so I might ride a little before the start tomorrow afternoon. With 200 riders in the race and the course being tricky, there is a good possibility that an early break will be the winning move. I’m going to have to be pretty lucky be able to read that move, assuming I’m having an okay day. Nowadays, I never know what kind of day I’m having until I’m already racing. Trudi leaving the drive on Monday, heading to Madison. 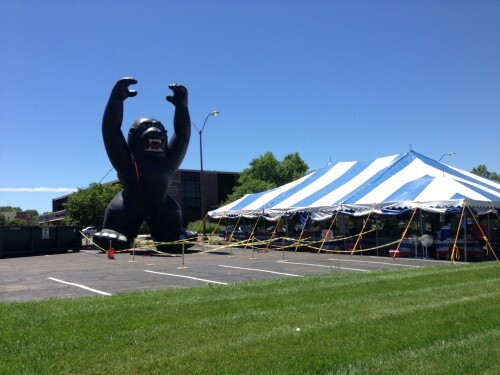 There are firework stands all over the city of Topeka. Bromont is happy we bugged out before today because it has been like a war zone there the last couple nights while we were out walking late. How is Bromont doing after surgery? It looks similar to the GPS tracker that I put in my teenage sons car. I think some insurance companies are using these for pay-as-you-drive rates. 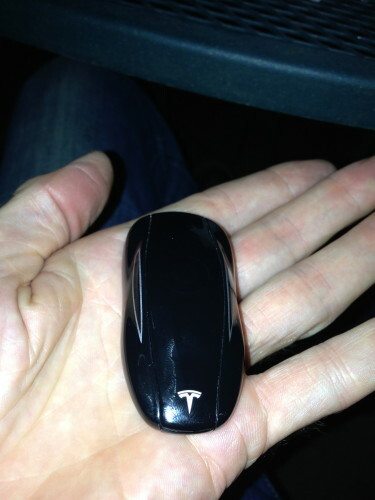 Yep-Tesla key. MG’s Telsa key to be exact. And David, Bromont is doing pretty well. He is running now. Kind of slowly, but he couldn’t run at all before. Wow, a highway 151 reference. It used to be a somewhat dangerous two lane road snaking through a bunch of small towns including my home town (Cascade). Much improved road now.